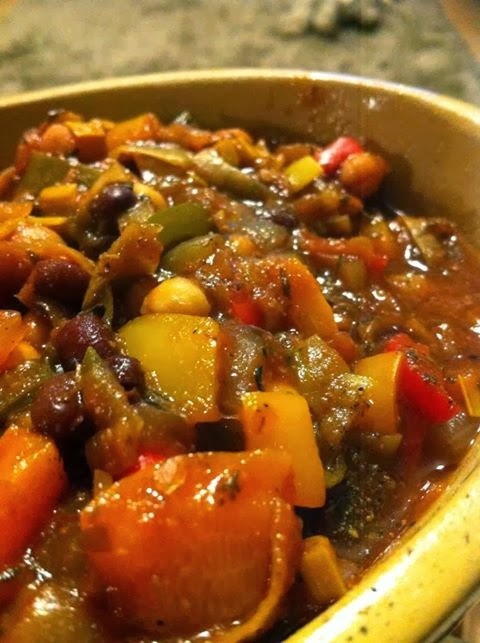 This mixed bean stew is versatile and free on the extra easy plan. It's another meal where I use whatever I have to hand. So don't worry if you have to improvise, that's my type of cooking! Just to warn you, it makes a lot so use a large pan with a lid. Add all the chopped up vegetables, balsamic vinegar and garlic and cook for another 5 minutes, stirring regularly. Chuck in all the other ingredients, plus about 200ml of water (I usually half fill the empty tin from the tomatoes and use that) Stir and simmer with the lid on the pan for about 30 minutes. The stew should be thick and glossy, if it isn't thick enough for you, continue simmering for another 10 minutes with the lid off. I like it in a huge bowl with a big spoon! MrC enjoys it with a chunk of bread to wipe up the gravy. You can try it stuffed in a wholemeal pitta, or on a baked potato, or with rice or over pasta (with a little cheese ??! ) or maybe all of them if you're good with leftovers! It makes a lot! I've got my eye on some which I'm planning to use to stuff red peppers and then bake. Oh, and if you like it spicy, try adding some chilli, beautiful!